A chart recorder is an instrument used to record various process and electrical signals. The most traditional chart recorders record data on paper. The paper is passed under a pen and the pen is deflected in proportion to the signal. The result is a graph or chart of the data. Chart recorders are available in single or multichannel styles (single or multipen) and in various configurations. Many of today's chart recorders can also record information in a digital format for download to a computer. There are scores of data recorder models on the market, ranging from several price ranges. Extremes—gone are the days when most data recorders could be classified as either simple, midrange, or complex. In recent years, for example, conventional analog chart recorders have hybridized with data loggers, and PC-based functions have been added to most of the product categories. When to Use a Chart Recorder? How to Select a Chart Recorder? Chart recorders are a familiar sight in manufacturing plants, where they track such variables as temperature, pressure, flow, pH, and humidity. Laboratories, meanwhile, use them to monitor scientific and engineering data generated in testing, diagnostics, statistical analysis, and other work requiring a graphic record. When Should I Use a Chart Recorder? When the process to be tracked involves limited variables that do not require a PC-based interface, paper and pen can still be the way to go. The advantage of a circular chart is its intuitiveness: at a glance, it gives a complete history of each selected variable over a specified period—a truly continuous display of a trend’s change with time. Strip chart recorders consist of a roll or strip of paper that is passed linearly beneath one or more pens. As the signal changes the pens deflect producing the resultant chart. Strip chart recorders are well suited for recording of continuous processes. Sections of the paper can be torn off and archived for future reference. Strip chart recorders are commonly used in laboratory as well as process measurement applications. A circular chart recorder records data in a circular format. The paper is spun beneath one or more pens. The pens are deflected in proportion to the varying signal resulting in a circular chart. 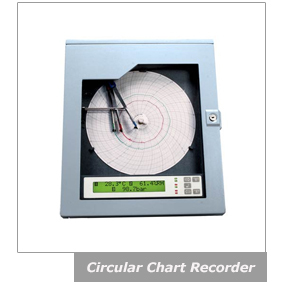 Circular chart recorders are ideal for batch processes where a set process time is known. The charts are normally designed to rotate in standard time periods, such as 1 hour, 24 hours, 7 days, etc., although many recorders are flexible enough to accommodate non-standard time periods. Y recorders accept two inputs and create a chart or graph of one input versus the other. They are commonly used to determine the relationship between the two inputs. For example in a chemical process, an XY recorder might be used to monitor the effect temperature has on the pressure of the process. A hybrid recorder can function as a recorder or data logger. Like a standard recorder the hybrid recorder can generate a chart of the inputs. However, it can also produce a digital stamp of the data similar to a data logger. They are commonly available in multichannel designs although one print head normally handles all channels. This makes the hybrid recorder a cost effective solution for multichannel systems although the response time is not as fast as recorders which have a unique pen for each channel. Paperless recorders are one of the latest types of recorders to emerge on the market. Paperless recorders display the chart on the recorders' graphic display rather than print the chart on paper. The data can normally be recorded in internal memory or to a memory card for later transfer to a computer. The major benefit of paperless recorders is conservation of paper and easy transfer to a computer. How many inputs need to be recorded? What types of inputs need to be recorded? Do different input types need to be recorded in the same unit? What type of recording is required? Is a communciation interface required? Is recorder to be bench style or panel mounting? What type of instrument power is available? Is log-type recording desirable instead of/in addition to trend recording? Is color differentiation available for trend lines? Is the recorder to perform alarm functions? How many setpoints per channel? What types of alarms: threshold, rate delta? Are physical relay contacts available for external alarm output?